Three weeks ago I attended a 3 day conference designed to help the delegates explore the unchangeable principles behind the human experience. The most powerful thing I understand better is that there are fundamental truths that control how we as humans operate, whether we know it or not. The first, very simple, step in having a greater life experience is simply to recognise their existence. A deeper understanding allows further upgrades but it all starts with appreciating what is going on. For example, there is a principle in the physical laws called gravity. We do not need to know anything about it or even agree with it but things will be pulled towards the ground by it. If you were not aware of gravity, you would be confused and have a hard time understanding why the object you just let go of in front of your face is not still there. You would have no idea where to find it either. Simply recognising that gravity exists will allow you to not be shocked that the object has moved. Further basic understanding teaches you to look down. A deeper knowledge enables you to do things like catching it before it smashes. One of the 3 unchangeable principles is that we already have all the wisdom we need inside us. So unlike science, there is no need to study. Teaching about the principles is therefore not an intellectual process but is a way of helping us to reveal the truths we already know. Another is that the thoughts we have control how we feel and how we perceive the world around us. No one and nothing external can make us feel something. Only our own inner thoughts can and do affect the outside world. I challenge each of you reading this to take step one and merely notice the effect your thoughts have. Enjoy your upgrade. At work, a group of us* are growing beards during November to raise money for The Prostate Cancer Charity. This is being done as part of the wider Movember movement. Please click through to donate and help us reach our target. The cause is really worthwhile, some of you will be investing in your future! * I include myself since I am growing a beard during November and do not think it is relevant that I already had one and will keep it afterwards! On sunday morning, eruv Yom Kippur, straight after kapores, Dina had a laparoscopic nephrectomy. When Dina was born, her left kidney did not develop properly and her consultant decided that it would be best for her in the long term to have it removed whilst she is still young. Due to the relocation and merging of Pendlebury and Booth Hall children's hospitals to become Royal Manchester Children's Hospital, dates for the operation were limited and eruv Yom Kippur was the best date we were given. In the run up to the operation Ma and I were both very worried and concerned for Dina. So were all of our families and friends. On Shabbos, I was given an aliyah at Mincha and a mi she'berach was said. The Rabbi dedicated his Shabbos Shuvah drosha to the speedy recovery for Dina. At kapores we put a sign out asking everyone to say Tehillim for Dina. Then, during the actual operation, Ma and I said Tehillim and duvened for Dina. I am reminded of the story of the business man who is on his way to an important meeting in the city centre. Parking is very busy and there are no spaces to be found. He is driving around the block for the 3rd time he prays and pleads with HaShem to make a miracle and help him find a space. As he is finishing his prayer, he looks up and sees that a car is pulling out of a space. "Don't worry HaShem", he says, "I found one." Why do I tell you this story? We are all faced with challenges in life and when the going gets tough we turn to HaShem. We pray to him and plead with him. The question is ... what happens after he has answered us? Baruch HaShem, the operation went to plan, and Dina is at home and making a good recovery. In fact, when you she her, you would not even realise that anything had been done. Thank you firstly to HaShem and secondly to all who duvened and said Tehillim for Dina. Clearly our prayers were answered favourably. I hope we all have a happy and a healthy 5770. Where is my nearest postbox? I have recently moved to a new office and needed to post a letter during lunchtime. I have seen postboxes while on the way to the office but I wanted to find the nearest box so that I quickly pop out during the day and catch that days post. So I turned to Google and found that Matthew Somerville has put together a site that combines Royal Mail's postbox location data, obtained under a freedom of information act request, with an interactive map. Bizarrely, Royal Mail does not actually know exactly where the postboxes are located. Matthew's site therefore relies on crowdsourcing to gain the location of many of the postboxes. I think this is a useful resource and it only takes a minute to add the location of a box so why not type the post code of areas you know to see if you can help to complete it. I read this yesterday on the wall in a waiting room and it made me smile so I thought I would share it with everyone. I was out walking with my 4 year old daughter. She picked up something off the ground and started to put it in her mouth. I took the item away from her and I asked her not to do that. “Why?” my daughter asked. “Exactly” I replied back with a big smile on my face. I have not taken the test but I think would probably fail! AT's Upshernish is on Thursday night. For any who can't make it, there will IY'H be a live stream at http://kayvee.camstreams.com. Its been a long time since my last post but I've been busy on something that I can hopefully reveal soon. It is my, delayed, pleasure to announce the birth of our daughter, Nechomo Dina. 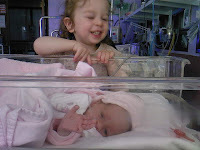 She was born 6 weeks early on 5/4/07, first day Chol HaMoed Pesach, at 16:42 and weighed 3 lbs. 12 oz. (1.7 kg). That means we now have two Pesach babies. One more and that will make a chazaka! Despite her early arrival, she is progressing well. As of today, she has returned to birth weight. She has moved from an incubator in intensive care to a cot in high dependency. AT has so far adapted well to his new role as big brother. On visits to see her he has been well behaved. Admittedly he spent one visit trying to talk to the wrong baby! Also very relevant is the fact that since Dina isn't home yet, she isn't direct competition.